A couple of months ago, Sandra had to drive to Lebanon, NH (about an hour and a half away from where we live) to go to the Dartmouth-Hitchcock Medical Center for some Girl Scout meeting (she's a leader of the Girl Scouts in Salem, and the council encompasses both Vermont and New Hampshire, so Lebanon at the western border of New Hampshire probably seemed to be a good "central" place to meet. Anyway, I surprised Sandra by offering to go with her. Actually, my offer was something to the effect of "I can find a few places to go in Lebanon. There's the Seven Barrel Brewery and a few shopping centers. Just call me when you're ready for me to pick you up." My wife really appreciated my offer and we drove there early one Saturday morning in August. We got there about a half hour early and there was a Co-op grocery store across the street for us to while away the extra time. After dropping Sandra off at the building she needed to be in, I drove into downtown Lebanon. For the past twenty years, Lebanon has been a stop off point for Sandra and me on our travels to Canada. The eight-hour trip can be broken into legs of one and a half to two hours, and Lebanon is usually our first stop on our way up to Canada, usually for dinner, before we switch drivers for the Vermont leg of the trip. So... I knew that there were a few fast food places in Lebanon, as well as the Seven Barrel Brewery, a brew pub very conveniently located at the intersection of downtown Lebanon and I-89. The food is all right at the Seven Barrel, and the beers are even better. I figured that I would have lunch there and look around at the shops we've seen in the past but never had any opportunity to explore. Since it was still early morning, my first stop was another grocery, but that got old quickly. I then drove to a little indoor shopping center and discovered a neat toy store. Around 10:30 or so, I pulled out my iPhone and did a Yelp search for restaurants nearby. It listed quite a few; most I never heard of before, and I read the reviews. Perhaps I wouldn't be going to the Seven Barrel after all. For instance, there was this Indian restaurant that looked promising. Of all the restaurants, however, the Seven Barrel wasn't listed. I was surprised, but I figured that it was probably listed on Yelp under a different category. Searching for Breweries didn't show up the Seven Barrel either. In fact, quite a few breweries were listed--one as far away as Burlington, VT (about a ninety minute drive; not really a contender!). To my surprise, however, was a brewery that I was familiar with, and it was only 10-15 minutes away. The Harpoon Brewery has two locations. One somewhere in the Boston area, and one in Windsor, Vermont. The Windsor location was one exit down I-91 past White River Junction, the point at which I-89 and I-91 intersect just over the border adjacent to Lebanon once you cross the White River into Vermont. I read the Yelp reviews, and found that the brewery had a lunch spot as well. All of a sudden, my plans changed. One of the beers I have been favoring recently is Harpoon's IPA, a nice and hoppy India Pale Ale. I'm not sure why my taste changed from my old standby, Bass Ale, but for the past year, Harpoon IPA has been my beer of choice. If a place doesn't have it, I try to find an IPA or Pale Ale or something else with a nice hoppy aftertaste, but my favorite is definitely Harpoon. Let me digress a bit here. 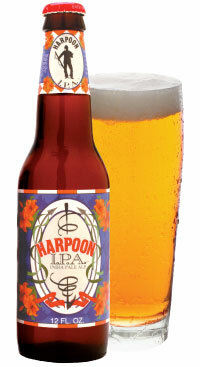 I've been drinking Harpoon IPA since the 1980's when I first moved into New England. During the 1990s, my favorite IPA (and favorite beer) was an IPA from the now-defunct Luck Now brewery (I toured their brewery at the Castle in the Clouds in Moultonborough in New Hampshire's lakes region. However, once Luck Now closed, I went back to Bass Ale. I'm not sure exactly when I moved over to Harpoon, but it must have been in the past year or so. I guess I've always liked IPAs, and every once in a while, I like the wonderfully bitter aftertaste. "Wow this is bitter! If you drink this before sampling the others- yuo wont [sic] be able to taste your beers." "Beautifully crafted and completely redeeming." Now, I know that IPAs are bitter. The bitterness comes from the hops and extra malts. The India in the name refers to the East India Company which shipped the highly hopped beer from Britain to India hundreds of years ago and, according to the Wikipedia, the beer "benefited exceptionally from conditions of the voyage and was apparently highly regarded among consumers in India." So, a reviewer complaining about the bitterness of an IPA is actually reporting on one of its defining characteristics. That, and the second review that said that Imperial IPA was beautifully crafted got my curiosity piqued. I was going to Windsor for lunch! The brewery is a short distance from the I-91 exit and shares a parking lot with a "Path of Life" sculpture garden (the sculpture garden requires an admission feed, there is no admission charge for the brewery and restaurant itself). When you first enter the building, you find yourself in their souvenir shop (a lot of Harpoon labeled clothes and merchandise). To your right is a door that leads to an overlook of the actual brewery floor. You can self-guide yourself thanks to the placards that outline the brewing process and offer some trivia. To the left is the Riverbend Taps and Beer Garden, their restaurant. I glanced at the merchandise as I walked toward the restaurant. I knew I wanted to try the Imperial IPA after those reviews, but they offered a sampler of five 5oz beers, which is what I ordered first. The menu at the restaurant can be described as your usual pub grub. Wings, chowder, salads, burgers, and sandwiches. Nothing on the menu was over $9. I ordered a bacon cheeseburger with onion rings. I gave them my usual "medium well to well" but it came out very (VERY!) rare. The waitress recognized the mistake and sent it back. A little bit later I got a new burger done correctly (and an apology from both the waitress and later on, from the manager). The Imperial Ale was part of the sampler, and it was as bitter as the one reviewer said. However, this was not a negative to me. Instead, it was wonderful! After I finished the sampler, I ordered a separate pint of the Imperial Ale, which was just as good as the sample. Before I left, I looked at the merchandise store, and fell in love with a red vest with the white Harpoon logo in back. The inside is black fleece, and there are Harpoon logos on the front left (front right if you wear it with the black fleece facing out). I purchased the vest, and it's currently my outerwear during the autumn into the early winter. For a brewery, the Windsor Harpoon brewery is small. It's nowhere near the size of the Anheuser Busch Brewery in Merrimack, NH (which is the smallest of all the Anheuser Busch breweries in America), or the Red Hook Brewery on the NH seacoast. However, it brews great beer. 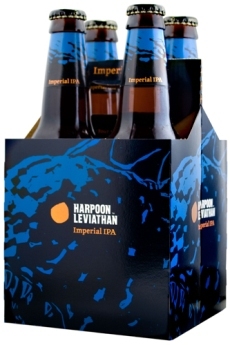 When I got back home, I was pleasantly surprised to find the Leviathan Imperial IPA in a local store. It's sold as a four pack costing about $10 or so; very expensive for a beer, but it is a great tasting one. I figure I'll buy some for special events like Thanksgiving or Christmas. Well, this coming weekend, Sandra has another Girl Scout meeting. This time it will be at the old Opera House in Claremont, NH. Claremont is another western border town, so when I found out about it, I whipped out my iPhone and located the place on Google Maps. Then I got directions from the Opera House to Windsor, VT. Guess what? It's 9.9 miles! Guess where I'll be going this weekend?